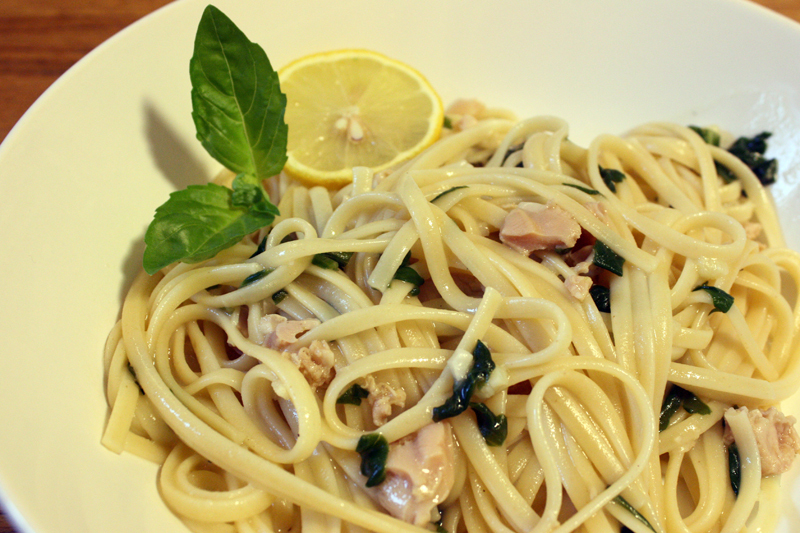 This is a very basic dish – pasta with a clam-based white sauce and bit of spinach and lemon juice to finish it off. Heat olive oil in a medium saucepan. Add garlic and saute for a minute or two, just until lightly golden. Turn off the heat and stir in the flour. When the mixture is smooth (except for the garlic pieces of course), start adding the clam juice gradually, stirring well after each addition. When all the juice (including the reserved liquid from the canned clams) is incorporated, bring to a boil and simmer until thickened, about a minute. Add the clams, pepper, lemon juice, spinach, and basil and stir until heated through. Remove from heat. Taste and add salt if necessary. Toss with hot cooked linguini and serve.